How to run a Docker Container on the vCenter Server Appliance (VCSA) 6.5? One of the most notable changes in the vCenter Server Appliance (VCSA) in vSphere 6.5 is a switch of the underlying OS from SLES to VMware's very own Photon OS. With this change, VMware will now own the entire software stack within the VCSA (OS + Application). This will allow VMware to quickly respond and deliver OS and security updates to customers at a much quicker rate than it was possible before. During my testing of the VCSA, I had a need to spin up a Docker Container. Given that the VCSA is now Photon OS based, this should be a pretty trivial thing to enable as it is with a standalone installation of Photon OS. After a bit of trial/error, I found what was needed to get this working on the VCSA. Before jumping into the solution, I should say that this is really for lab and educational purposes. In general, I would NOT recommend installing additional software on the VCSA, not only is this NOT supported by VMware but you may also potentially be impacting your vCenter Server by taking resources away from the main application. It is possible to constrain the amount of resources (CPU/Memory) allocated to the Docker Container, please refer to this resource for more information. For smaller customers, the argument is that I can just run everything on a single system but in reality there are many benefits to having a separate management VM which can be Photon OS or any other OS that your organization supports. You can install additional management tools/scripts and you would not be artificially limited by the VCSA's environment which is really locked down to what is absolutely needed to run the vCenter Server application and its services. Note: The above command does not persist across reboots. If you would like to persist this configuration, please refer to the instructions at the very bottom. docker build -t vmware/powercli . Step 1 - Edit /etc/modprobe.d/modprobe.conf and remove the "install bridge /bin/false" entry. Step 2 - Create a new file called /etc/modules-load.d/bridge.conf which contains the word "bridge" (no quotes). When the system boots up, it will iterate through all the module configuration file and load the respective modules. 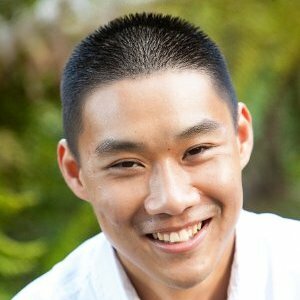 The bridge module is what is needed to start the Docker Daemon. 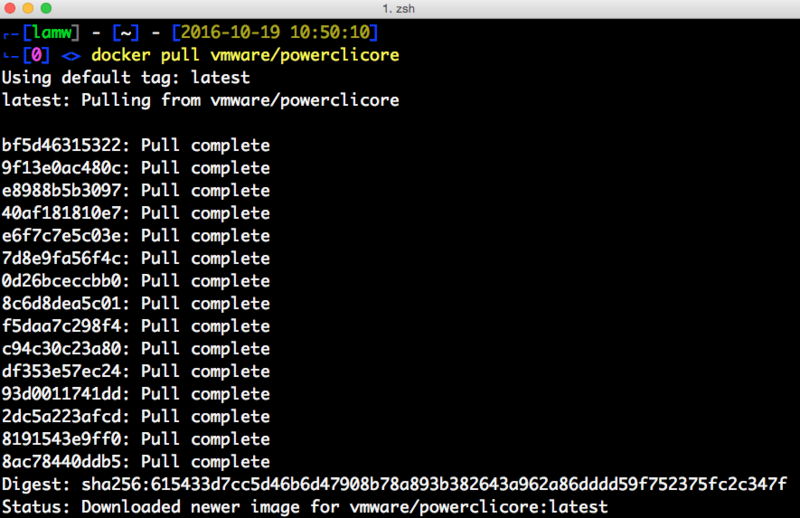 The much anticipated PowerCLI Core was just released this week as a VMware Fling which allows you to run PowerCLI on Linux, Mac OS X or even as a Docker Container. This is HUGE if you ask me, especially for customers who would like the benefits of PowerCLI and not be forced to use a Windows system which it traditionally had required. I personally have been using PowerCLI Core for quite some time now on my Mac OS X and the experience is exactly the same as you would find it on its Windows counterpart. The Docker Container is also a another great way to consume PowerCLI Core and I also use that quite frequently as well. One thing I felt that would make the Docker Container even easier to consume for those looking to do something really quick in PowerCLI or what I call "Just In time PowerCLI access" is to be able to quickly pull it down from Docker Hub rather than having to download bunch some files and then manually build it yourself (not that it is complicated) but sometimes speed is the game. I had posted a tweet earlier this morning and literally a few hours later, my good friend Alan Renouf delivered the goods! In addition, you will also find that the new version of PowerCLI Core Docker Container is now using Photon OS image rather than Ubuntu as it previously did. 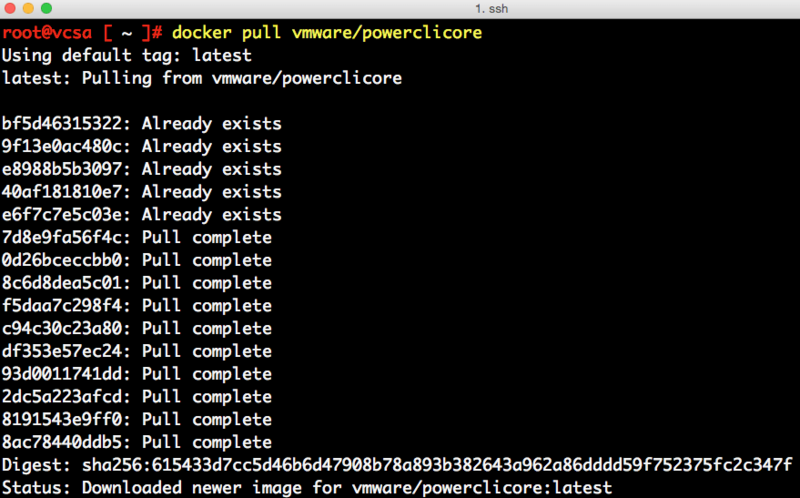 Asked for @PowerCLI Core to be hosted on @Docker Hub & the MAN (@alanrenouf)) delivers! UPDATE (01/03/17) - It looks like PowerNSX is now also included with PowerCLI Core. To use PowerNSX, simply import it by running the following command: Import-Module PowerNSX and you will now have access to the PowerNSX cmdlets! Nice job to the PowerNSX guys for making this possible for our customers! 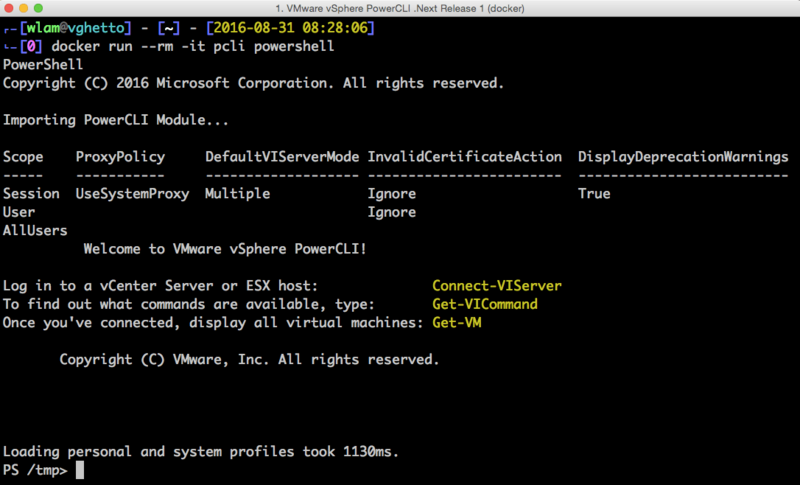 UPDATE (10/18/16) - PowerCLI Multi-Platform (MP) for Linux and Mac OS X has now been released as a VMware Fling. Please find the download here and provide any feedback in the comments section. This exciting update was only possible with the help of our friends over at Microsoft who had recently open sourced both .NET Core & PowerShell. Once that news broke, Alan and the PowerCLI Engineering team have been working hard on porting over the existing PowerCLI code which uses the Windows .NET library over to the new .NET Core which is now open sourced. I have been very impressed at how fast the PowerCLI team have already made available many of the default cmdlets as well as the Get View cmdlet which exposes the entire functionality of the vSphere API. 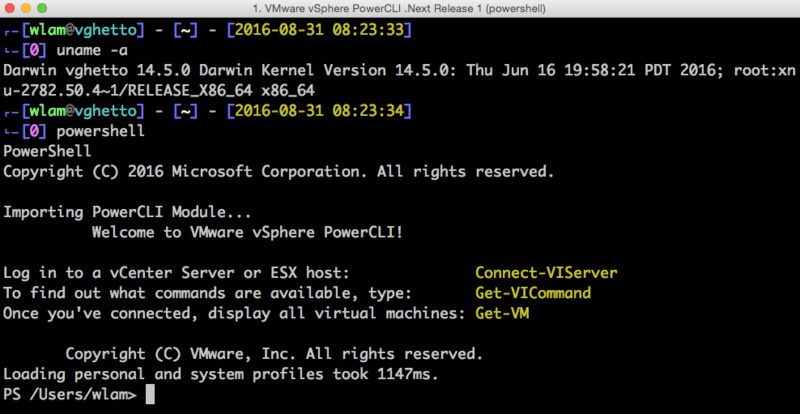 Now, before you get too excited, this new version of PowerCLI is currently not available yet. As Alan mentioned in his session, we plan to release an early Tech Preview of PowerCLI for both Mac OS X and Linux as a VMware Fling shortly after VMworld. It is also very important to note that Microsoft PowerShell for Mac OS X & Linux which PowerCLI uses is just at an Alpha release milestone. There is still much work to do on both sides but I am really looking forward to enabling our customers with the choice of platform when it comes to consuming PowerCLI. A few of us have been quite fortunate to have been involved in the early development of this new version of PowerCLI. In fact, we even built a simple Docker Container for PowerCLI which will allow you to easily access PowerCLI from any system that can run Docker. Here is a quick screenshot of spinning up a PowerCLI Docker Container which will also be part of the Fling release. Lastly, we want customers to be able to quickly and securely set up a persistent PowerCLI environment in which they can use to manage and configure their VMware-based products that support PowerCLI. With that, we have also built a PowerShell package for Photon OS which is VMware's minimal Linux container host distribution. Not only is it free to download and use, but it literally takes a few seconds to install (tdnf -y install powershell) and even less time to boot up and import the PowerCLI module. This was literally done the week before VMworld by the Photon team and huge kudos for their support! As you can see, not only do we want to provide choice for our customers but also simplifying how you might consume PowerCLI whether its natively on Windows, Mac OS X, Linux, Docker Container or running on top of VMware Photon OS. I hope you are excited as I am and stay tuned for more details on the Fling release! If you have any feedback or what you are most excited regarding this news, please leave a comment and I will make sure it makes it way back to our Product Manager.